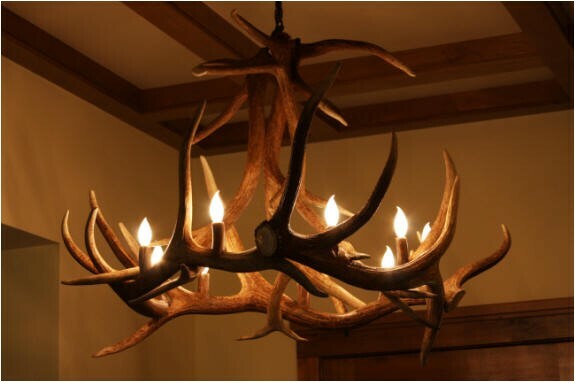 Antler lighting is truly unique and perfectly elegant in any home. 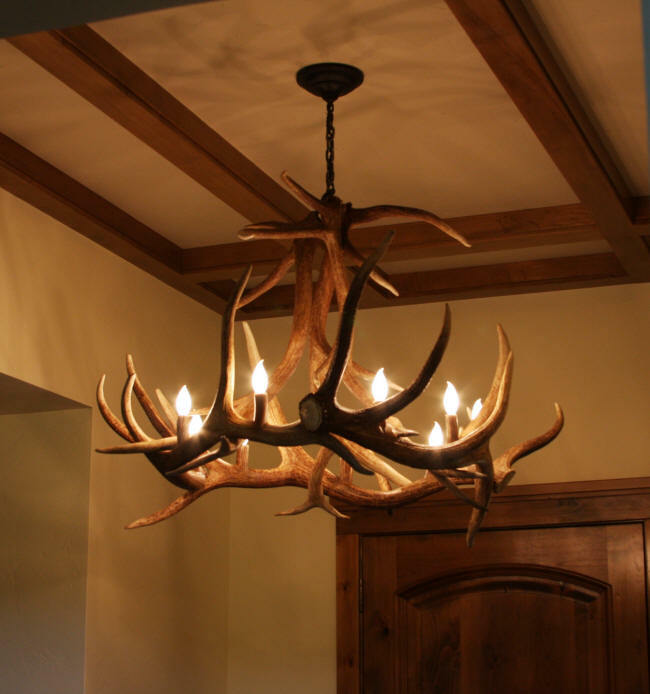 We build a variety of antler lighting from chandeliers, antler bar lights, antler sconces, vanity lights, and simple antler pendant lights. 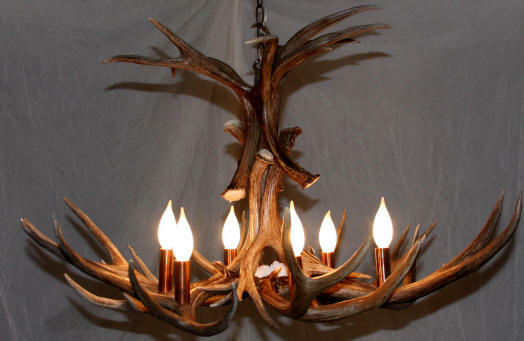 There is an art to building antler chandeliers and lamps. 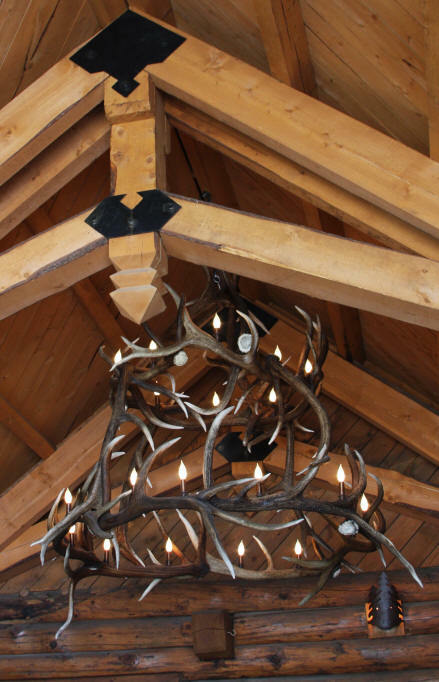 The wires run through the antler beams; no bolts or screws are ever visible in our lighting. 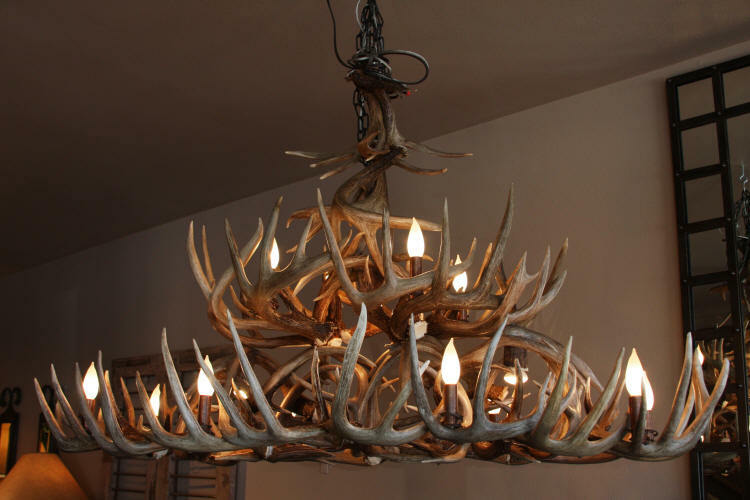 All antler chandeliers come with three feet of chain as well as light bulbs. 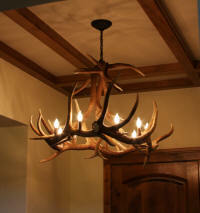 Scroll down to view all our antler chandeliers or choose the species or style you are interested in. 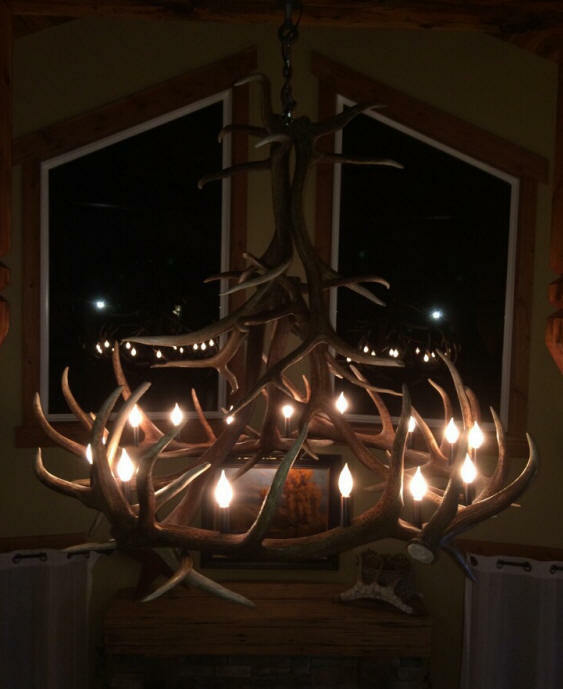 Our whitetail dining light is a whopper of a whitetail antler chandelier, made with approximately fifty two whitetail antlers. 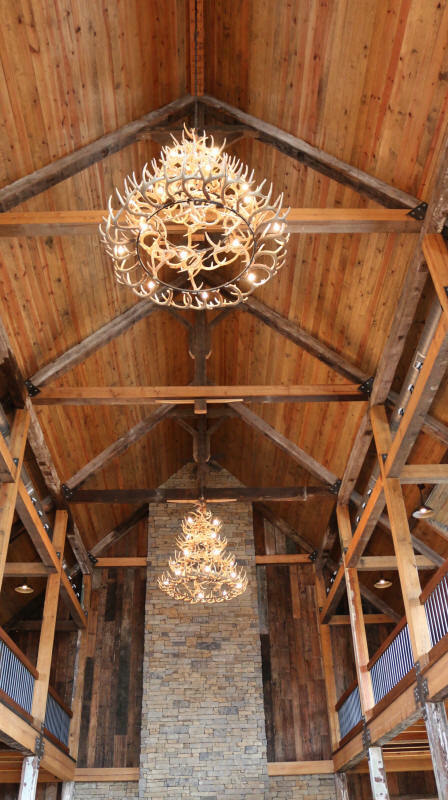 This is a two tier chandelier with eight lights on bottom tier, and four lights on top. The candle sleeves are copper with barbed wire bases. Approximate dimensions are 60"L x 36"W x 36"H.
Five moose antler chandelier with nine lights. 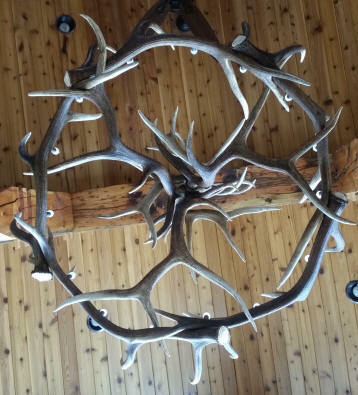 Three antlers base diameter is 50". This is an example of our standard five moose antler chandelier. 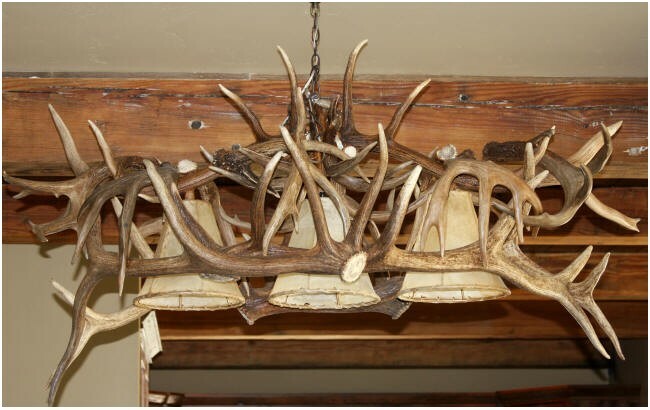 No two are the same as all antlers vary. 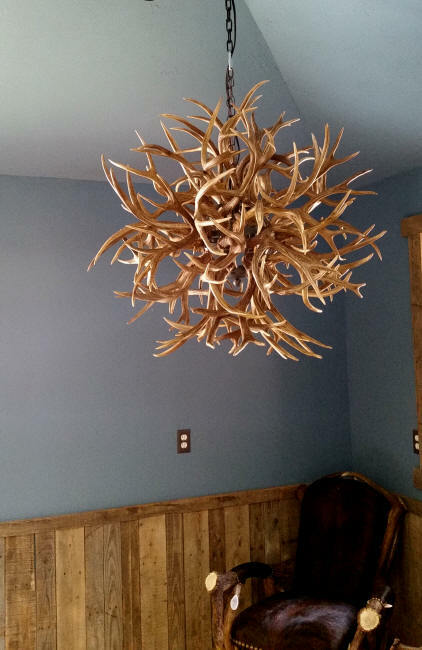 A very unique star or sphere shaped mule deer antler chandelier. 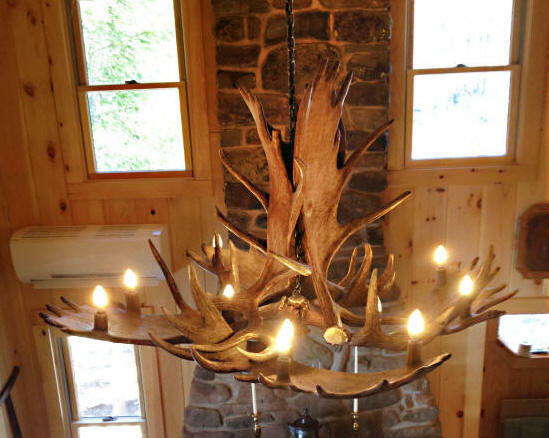 Center of chandelier is forged hammered iron and holds three lights. 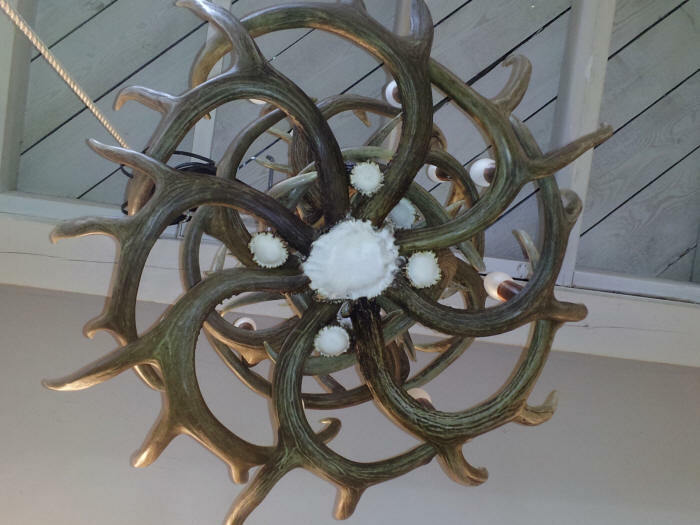 Pictured is 40" diameter chandelier, available in 50" and 60" diameter. 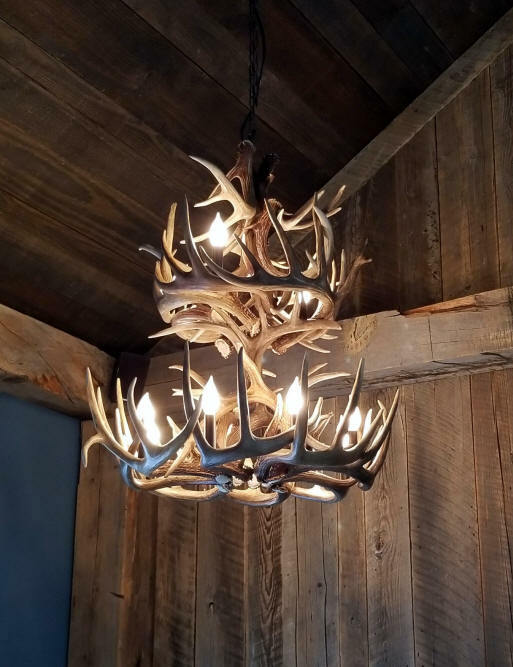 Similar to the "Tumbleweed" antler chandelier. 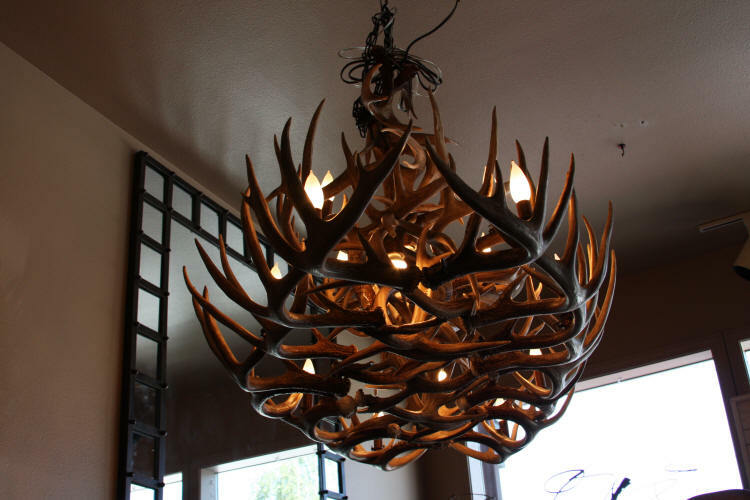 This antler ball chandelier is made from whitetail antlers. 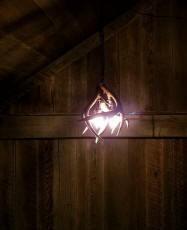 Center is forged iron with three lights. A smaller version of the "Starburst" Chandelier. This sphere shaped whitetail antler light has 3 lights. Diameter between 24-30. 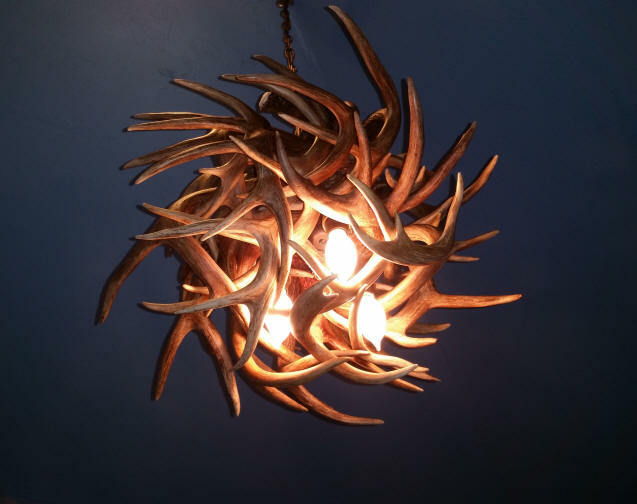 This light is a perfect accent piece or pendant for your smaller spaces. 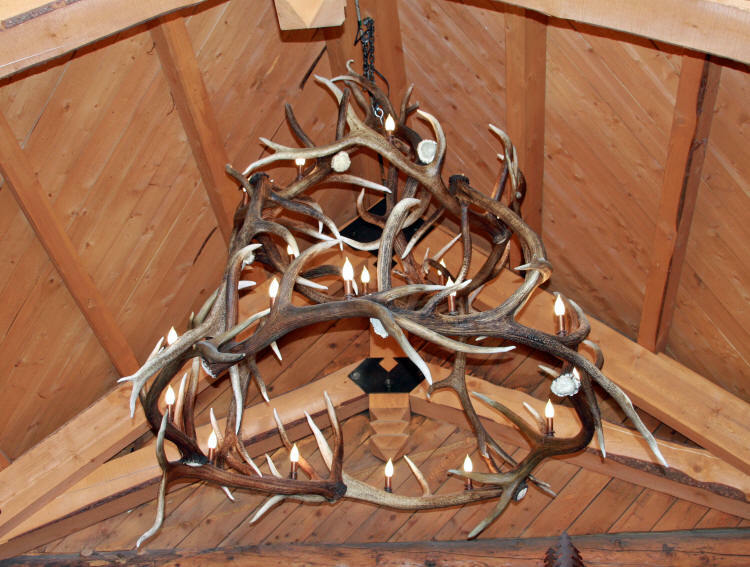 This chandelier has seven moose antlers, four make up the base and three are upright. 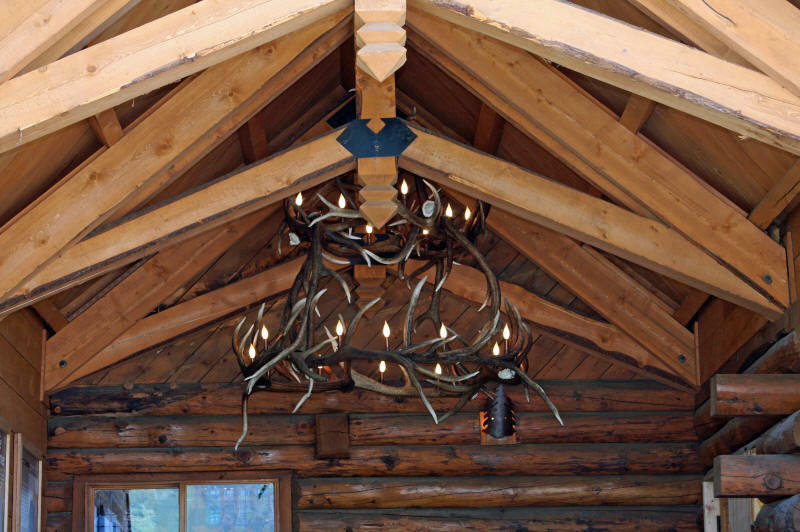 The four base antlers each have 3 lights, for a total of 12 lights with copper bases. 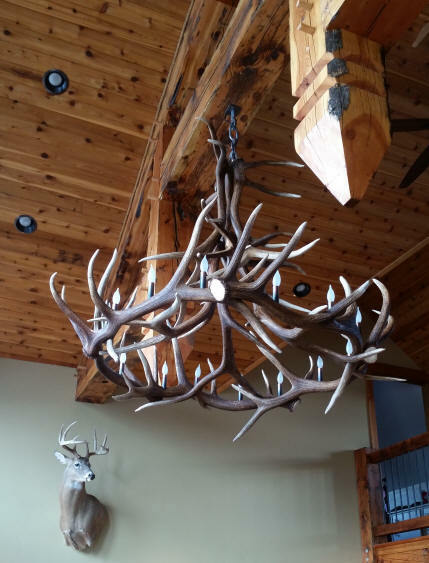 We offer four different diameters for this chandelier. 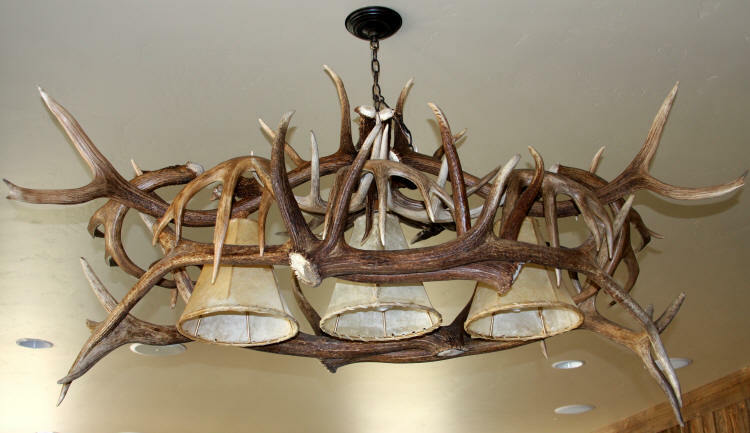 Large flat bottom whitetail antler chandelier with two turns of antlers. 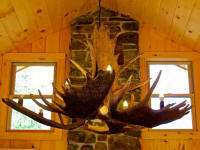 Size can vary with 44-48" diameter and 36" height. 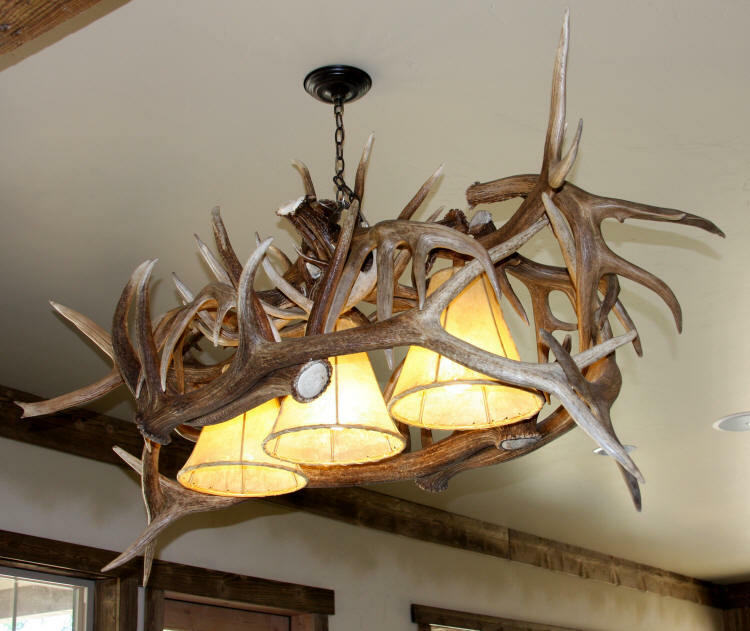 Our caribou antler chandelier is made of two large caribou antlers that are balanced in size and shape. 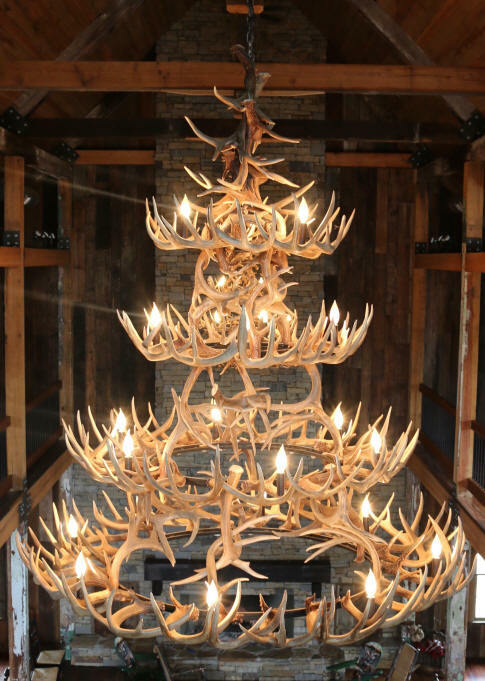 Each antler has four copper candelabra lights and there is one large down light in center. 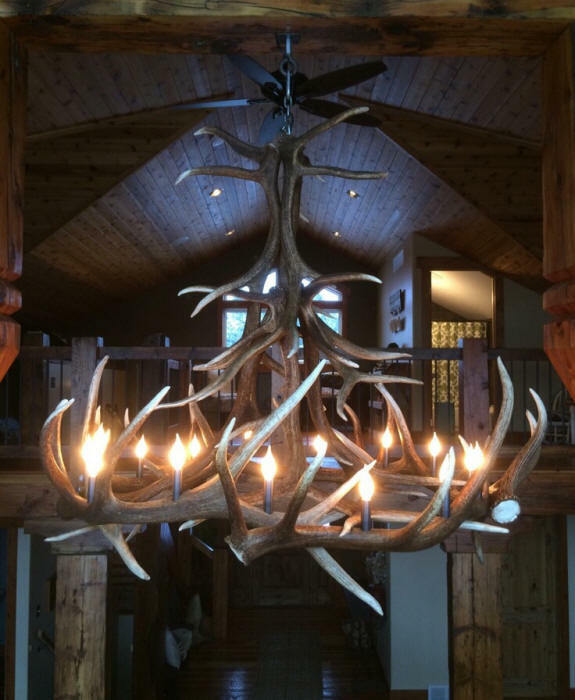 By far one of our customer favorites, this large whitetail antler chandelier has four tiers with 24 lights and nearly 100 whitetail antlers. 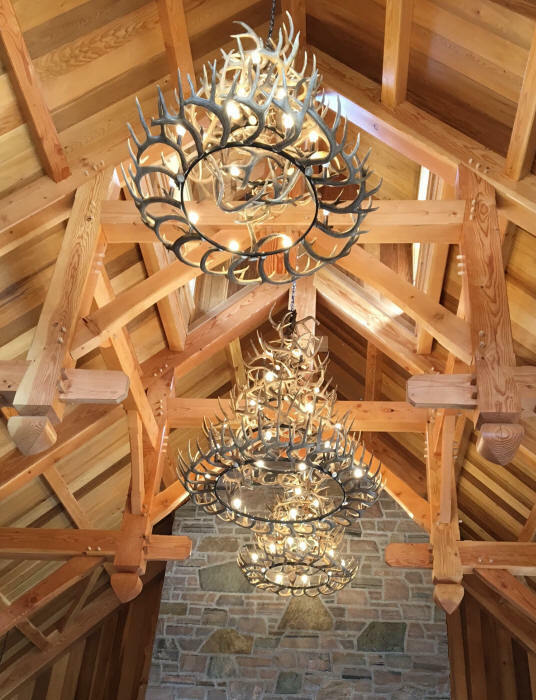 Light bases are made from copper. 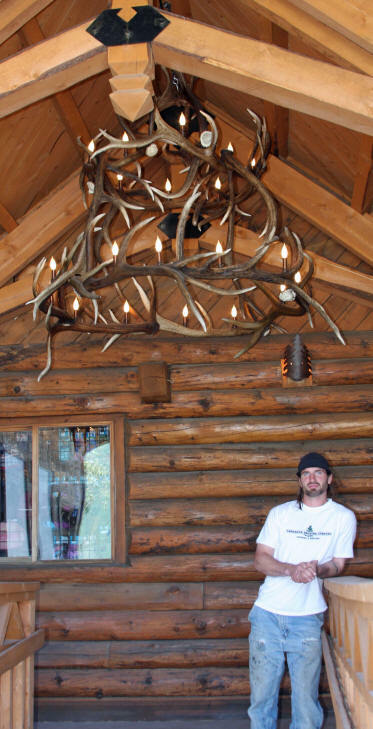 Approximate diameter 5' and overall height 6'. 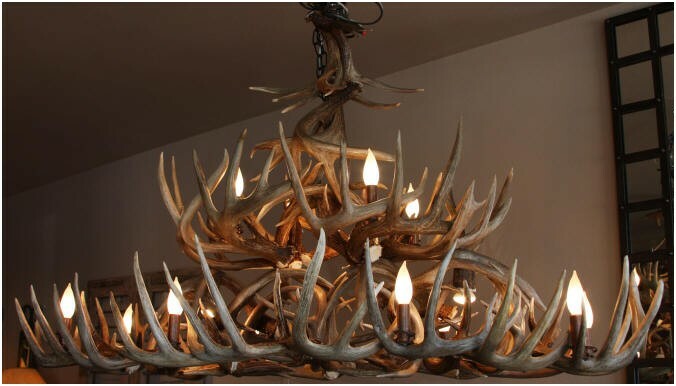 Three tier whitetail antler chandelier with 19 lights and 60 whitetail antlers. Light bases are custom fit with copper. 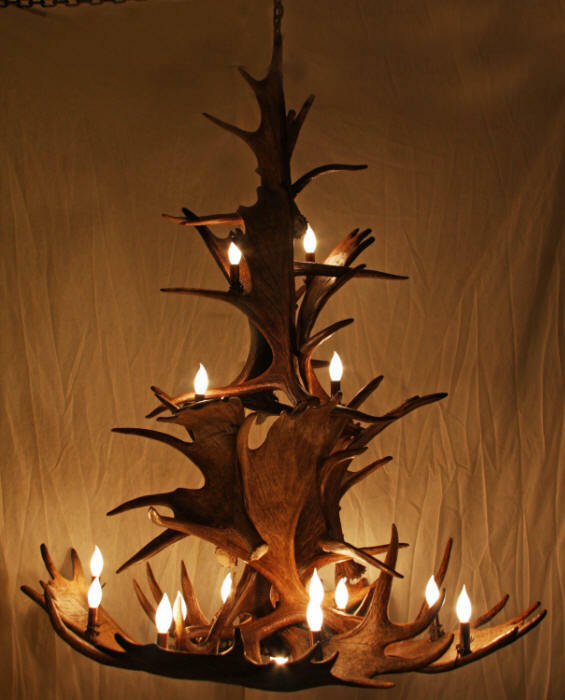 Approximate diameter is 4' and overall height 5'. 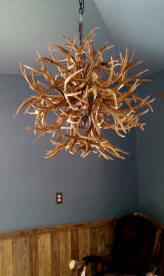 One of our larger elk antler chandeliers. 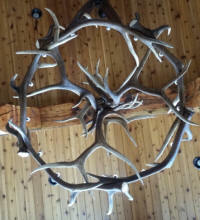 The diameter 65-68" with five six point elk antlers making up the circle and 6 more up the center to the peak. The height is 60". 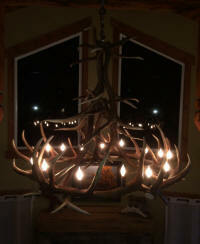 We make this chandelier with 10 or 15 lights. 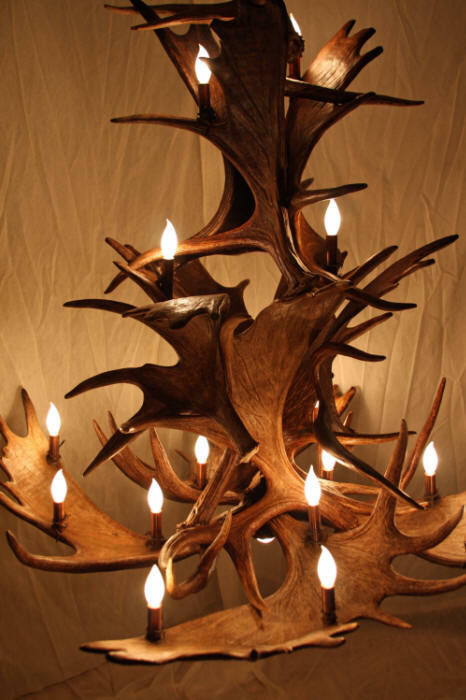 Three tier cascading moose chandelier with 17 lights. 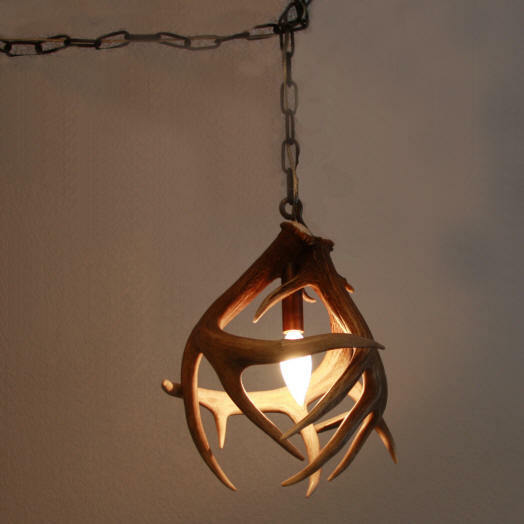 Light base made from copper with barbed wire. 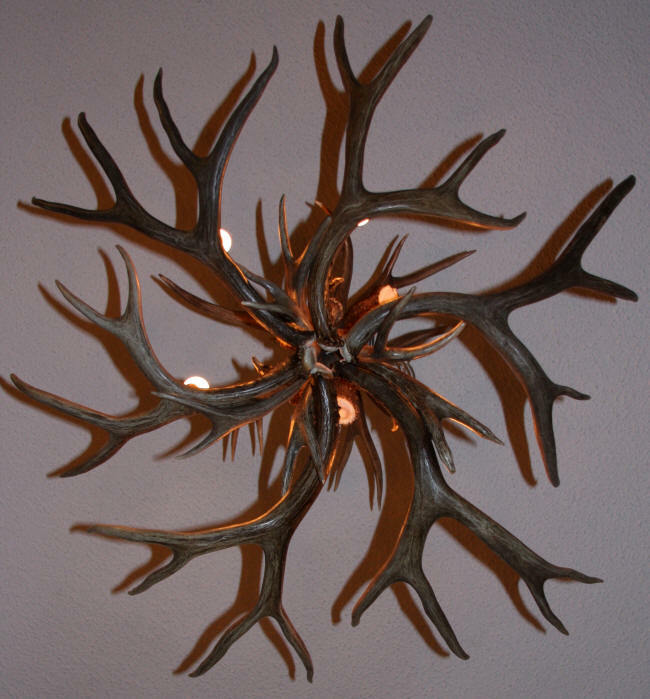 Diameter 52" and overall height 56". Sizes may vary. 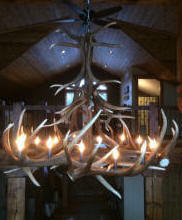 Two tier elk antler chandelier made for The Alaska Wildlife Conservation Center. 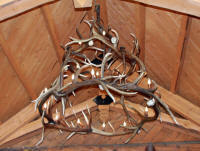 All antlers were supplied by the Conservation Center. 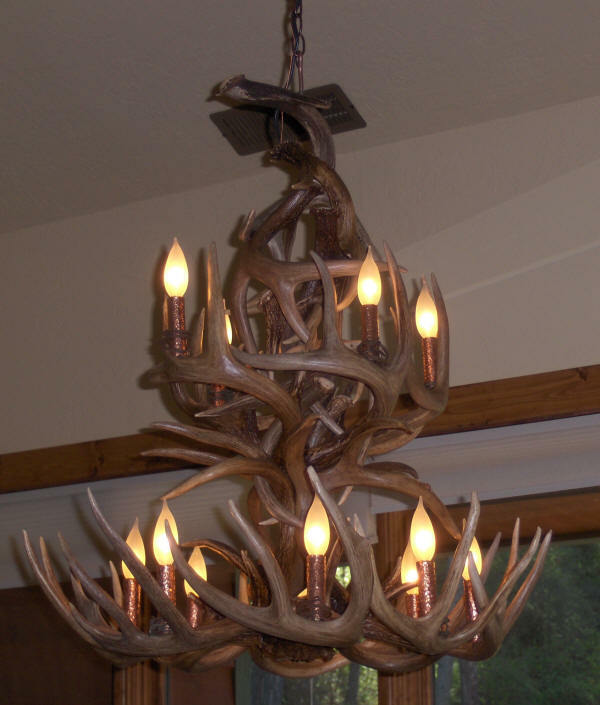 The chandelier stands 7' tall and is 6' wide. 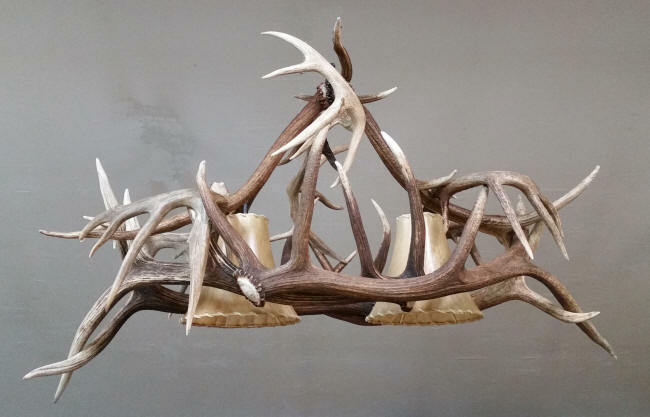 Custom mule deer and whitetail antler vanity light. 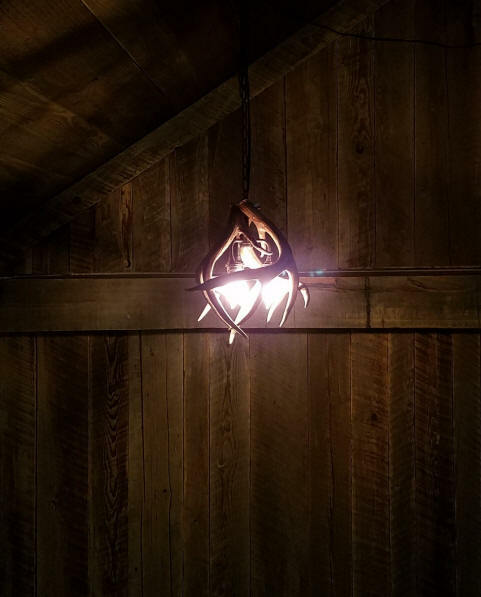 Three lights with copper lighting sleeves. 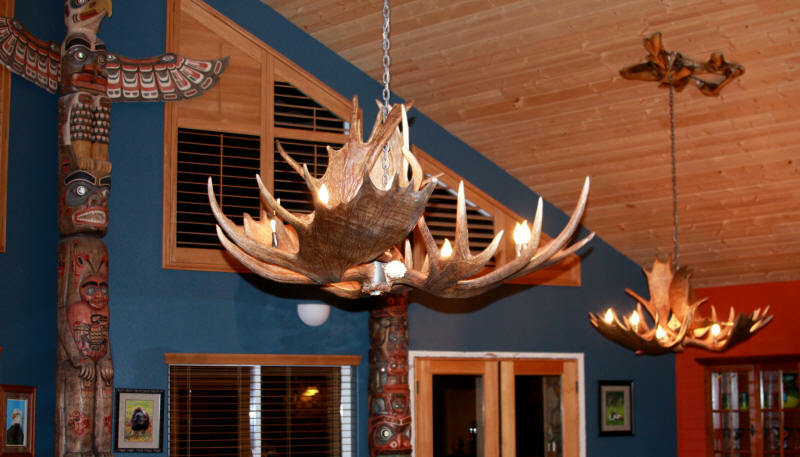 "Mount Magnificent" is a different style of moose antler chandelier. 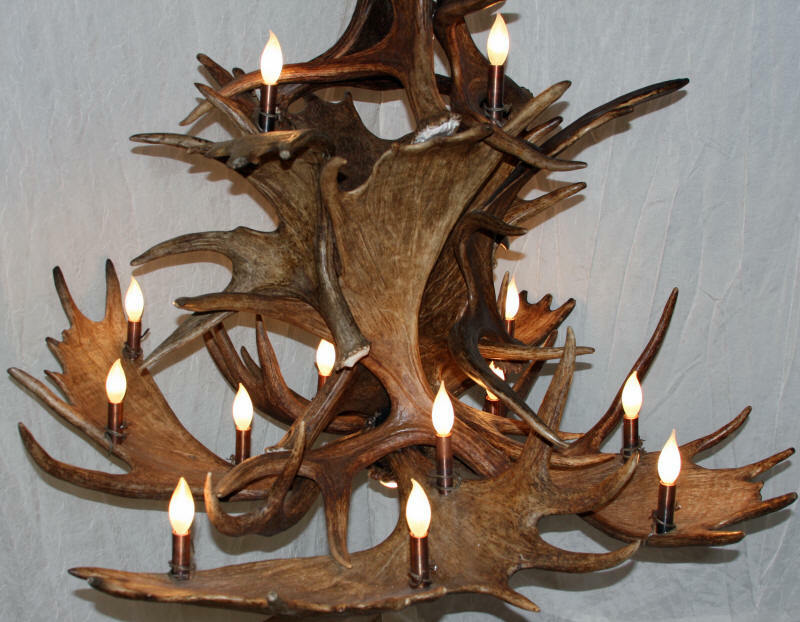 Four large moose paddles make up this antler chandelier with twelve lights, candelabra bases are patina copper. 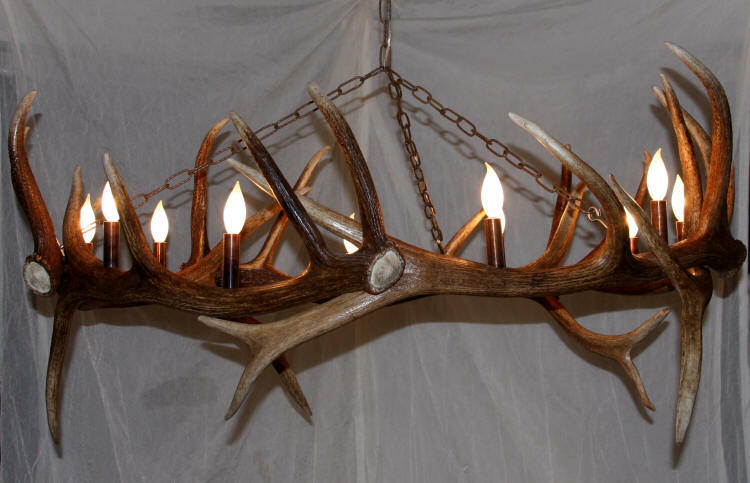 Large 12 light mule deer antler chandelier with copper light sleeves. 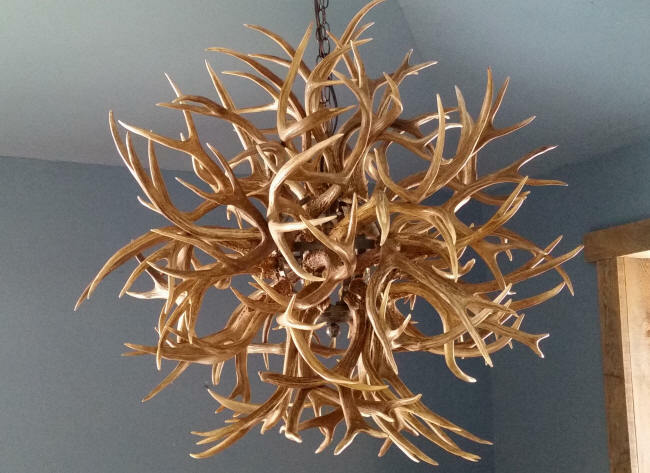 The approximate dimensions are 36"W x 36"H.
A whitetail antler version of our original "Porcupine" Chandelier. Elk and whitetail antler chandelier with three down lights and rawhide shades. 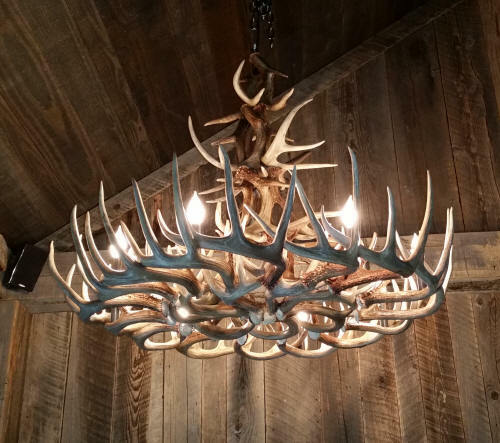 This light can be used over a dining table, bar, or pool table. 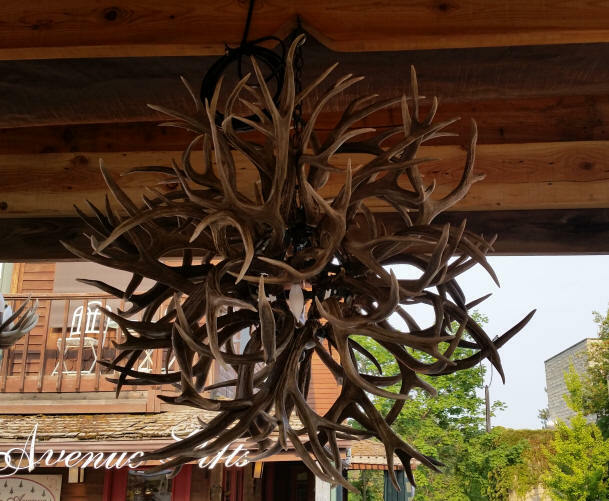 The chandelier is oval shaped with approximate dimensions of 55"L x 26"W x 32"H.
A smaller variation of our dining table or bar light is made of elk and deer antlers with only two down lights. 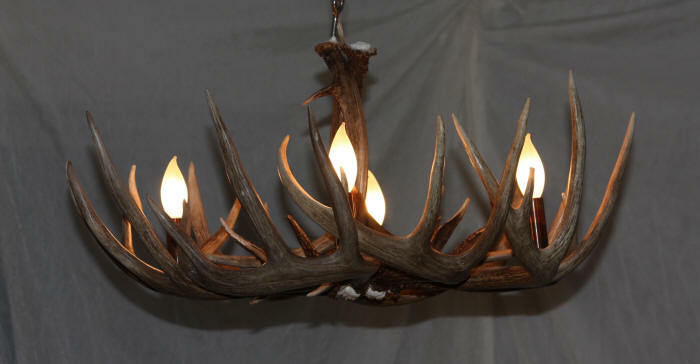 Our medium elk antler chandelier has a total of seven elk antlers. 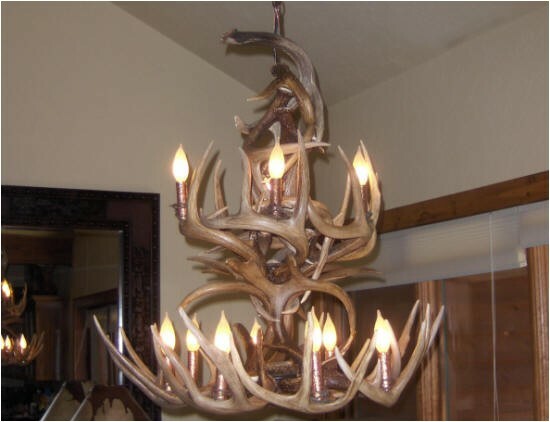 Four large six point elk antlers make up the bottom of the chandelier, while three medium six point antlers run up and to the center. 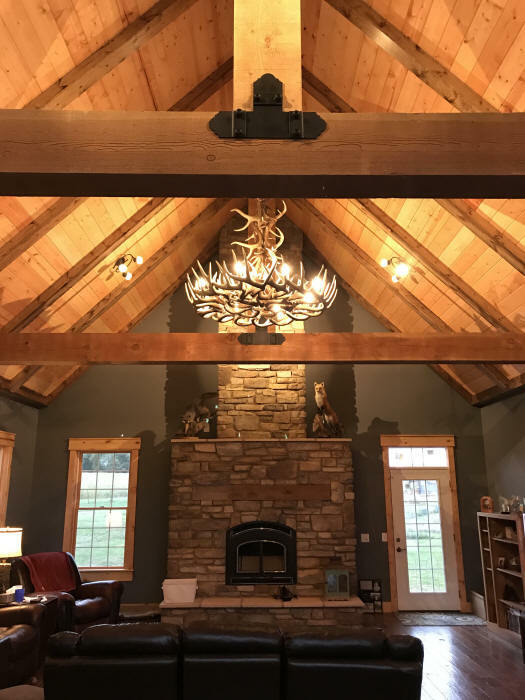 Diameter range from 44" to 48" and height is approximately 3'. 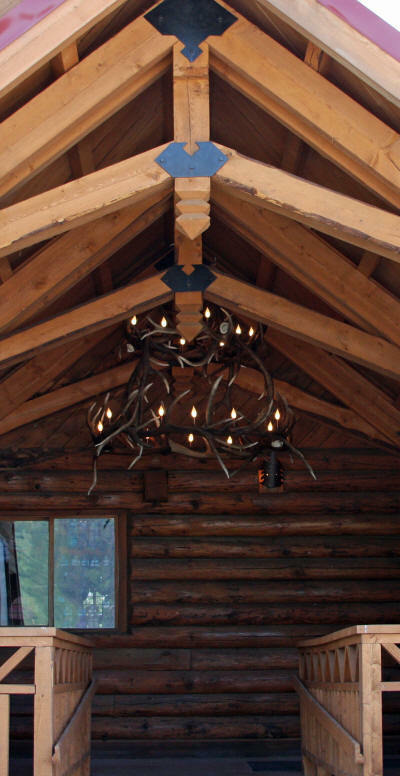 Eight lights with copper light covers. 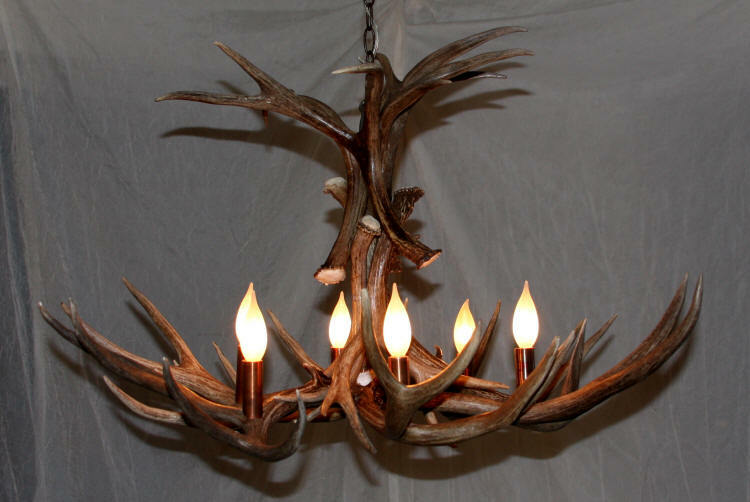 A single tier whitetail antler chandelier with a bit more height than or standard single tier. 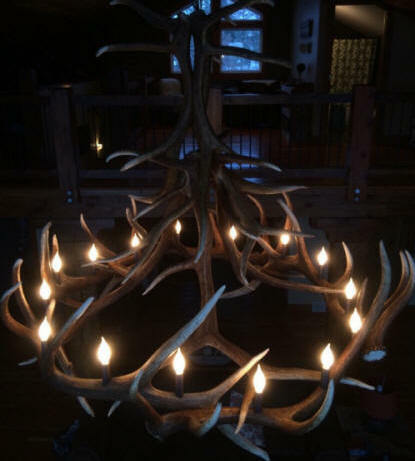 The base circle of this chandelier has 8 antlers, the center has 6. 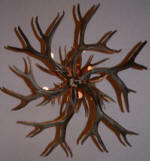 Available with 6-8 lights; light bases made from copper. 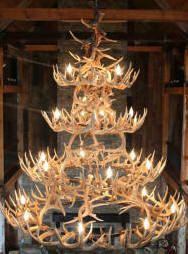 This is a custom built round two tier whitetail antler chandelier. 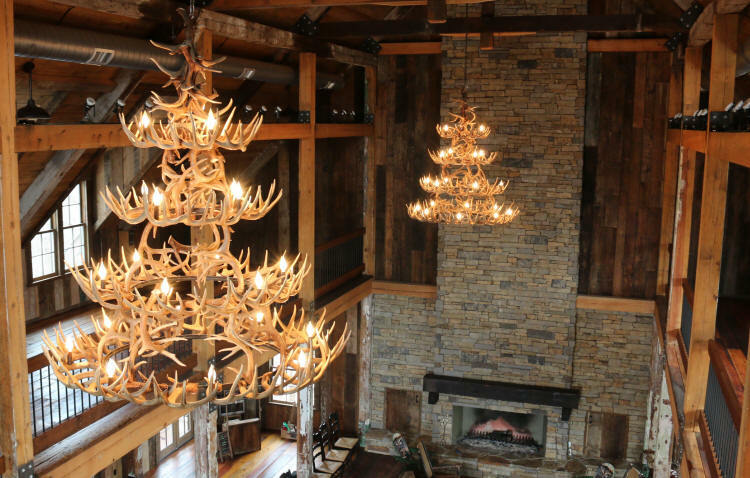 The first tier has eight lights and the second has four. 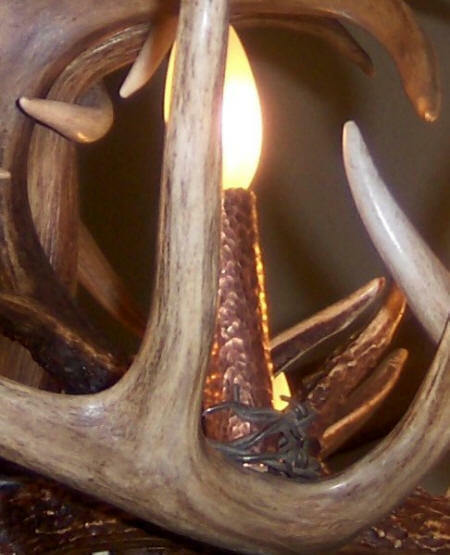 The candle sleeves are copper. 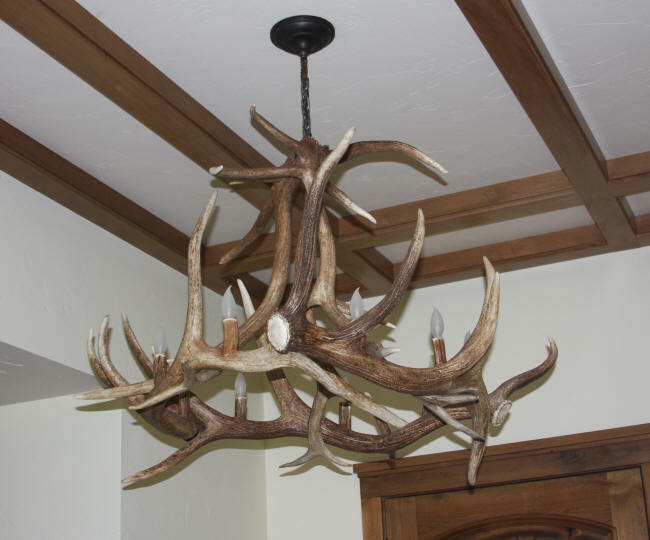 Approximate dimensions are 30"w x 36"h.
Our single tier whitetail antler chandelier is made with ten natural whitetail antlers. 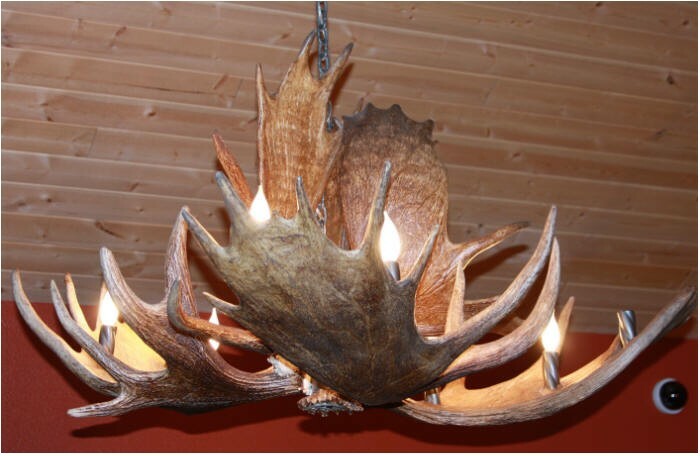 All wiring is completely hidden within the antlers. 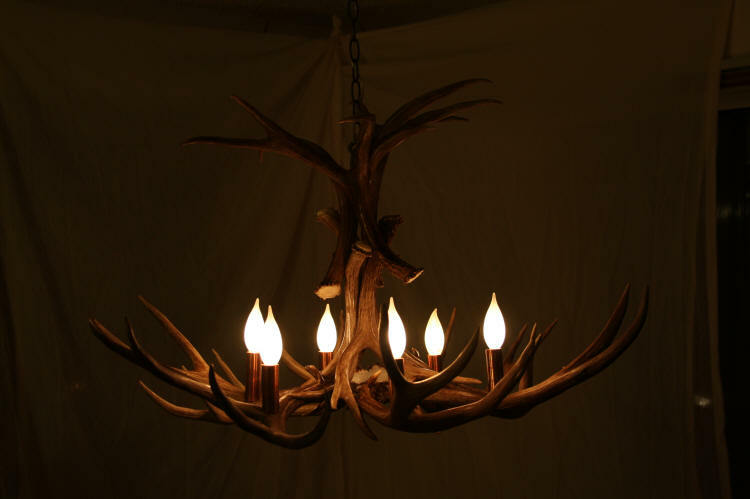 This chandelier has four lights, each sleeve is copper. Three feet of chain is provided, and more is available upon request. Approximate dimensions 26"W x 15" H.
A simple whitetail antler chandelier made from three whitetail antlers. 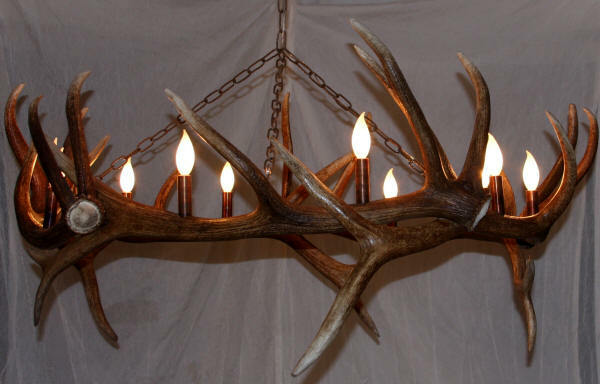 Three lights with copper candelabra bases. 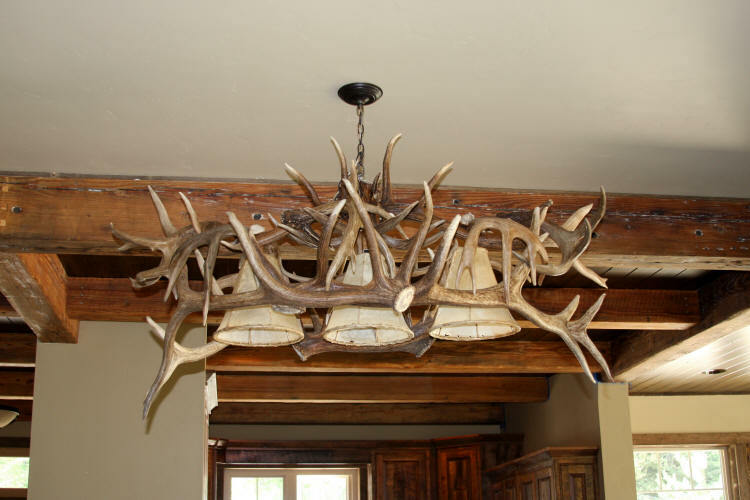 Simple mule deer antler chandelier with four antlers in the base and two upright antlers. Four lights with copper candelabra bases. 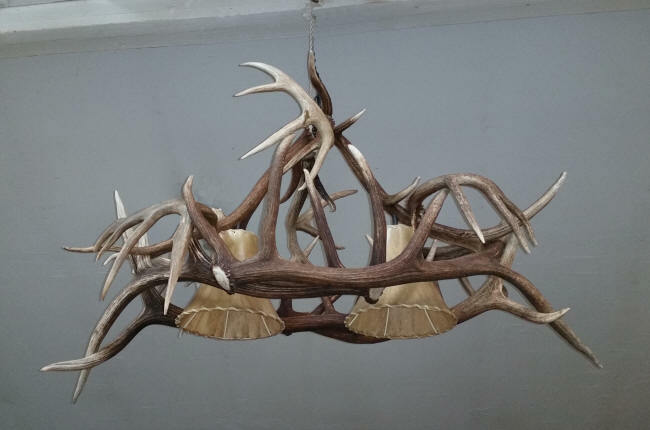 Single tier elk antler chandelier with five naturally shed elk antlers. 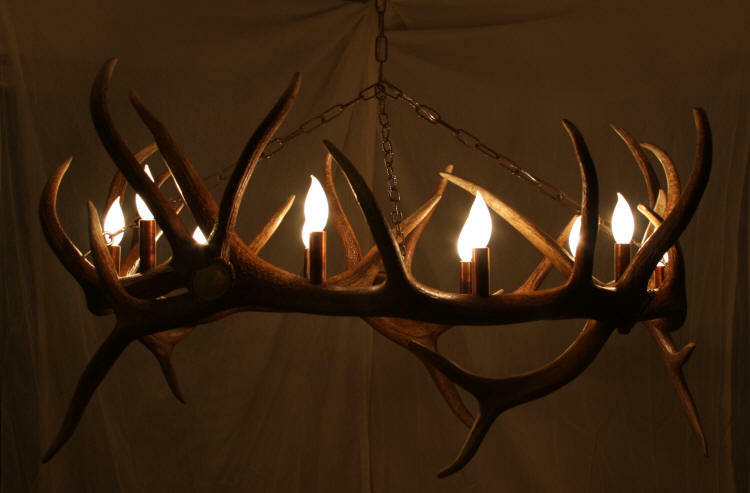 Two lights per antler, all light have copper aged copper sleeves. 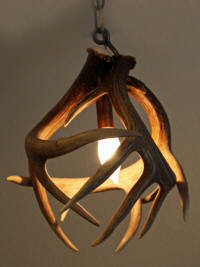 Small whitetail antler pendant light with three antlers. 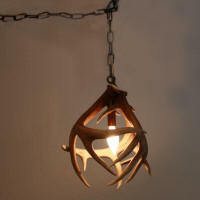 Perfect alone or in a small group of three pendants for your entrance, or over a bar. This pendant can also be made with mule deer antlers. 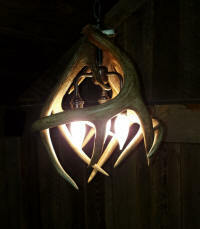 Small whitetail antler pendant light with three antlers and three lights. 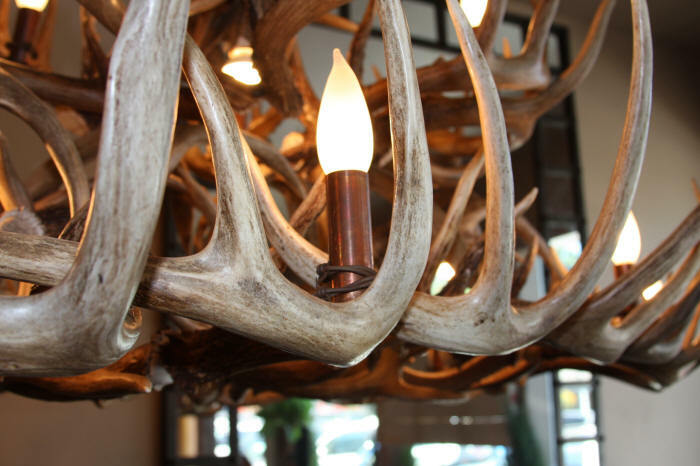 For your larger entry, our caribou antler pendant is a single bull caribou antler. 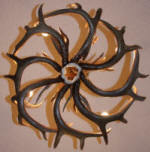 Mule deer antler wall sconce with single copper based light. 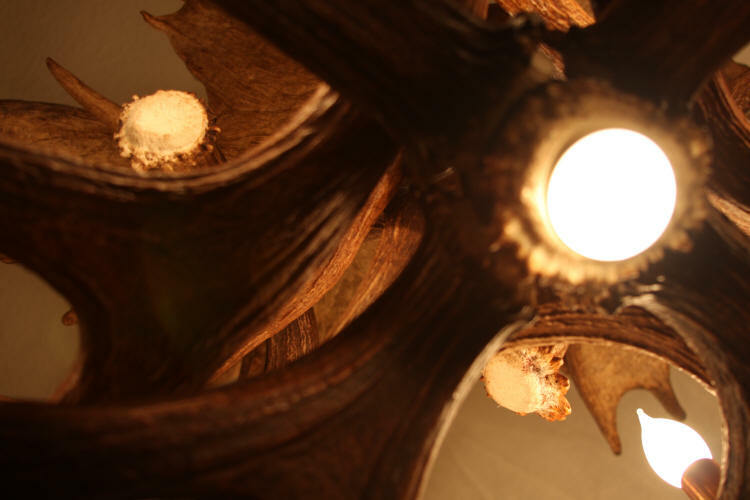 Choice of either plug in light or hardwired. 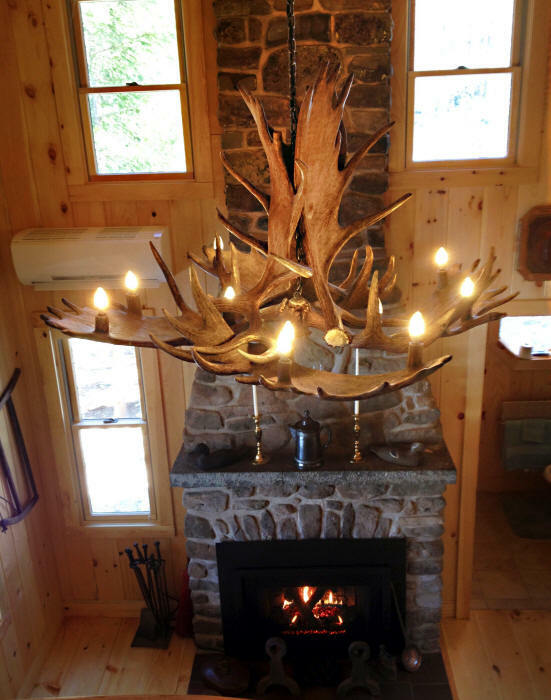 A single moose antler light with five lights. 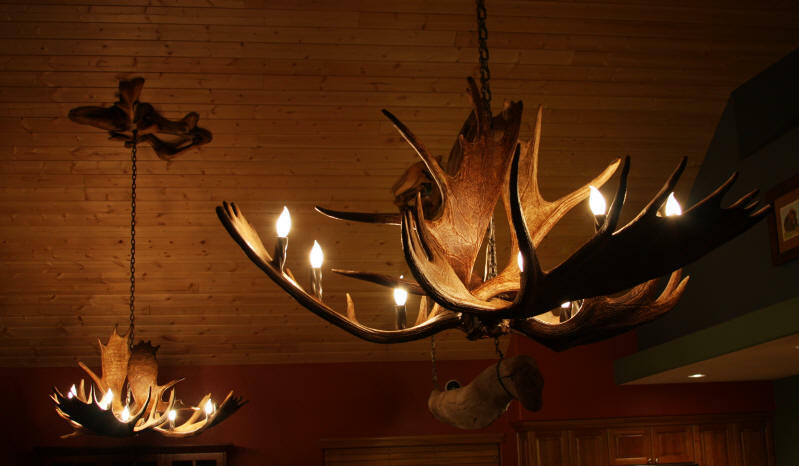 Light bases are made from copper. 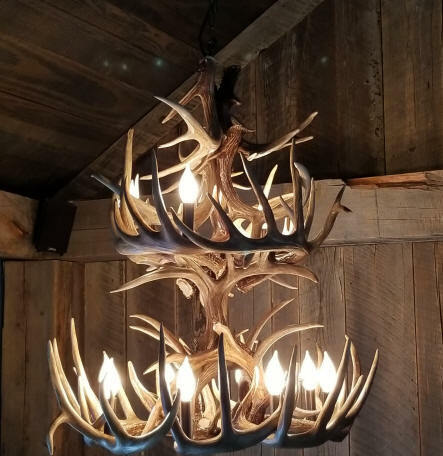 This light was built uniquely for a customer for a special location in her home. 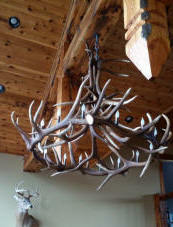 Per her request, rather than hang it from her high ceiling we attached it to the wall with iron accents. 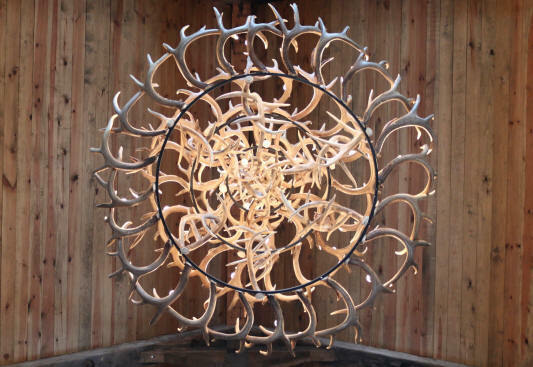 The light is made from eight naturally shed elk antlers with five lights. More antler lighting on our Lamps and Shades Page.